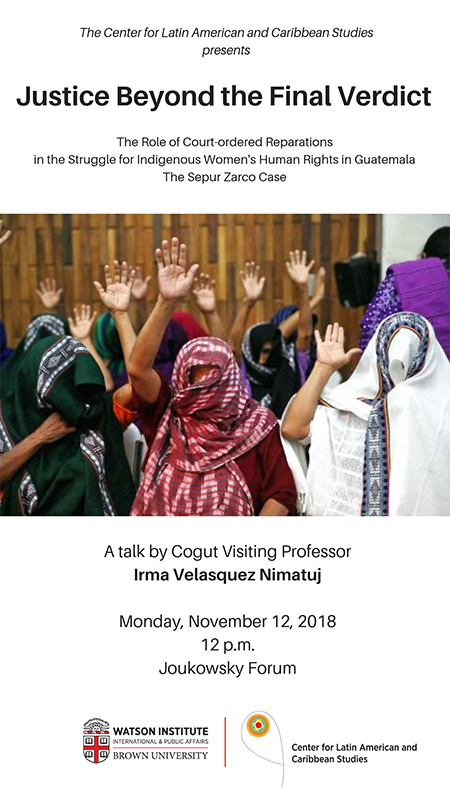 Irma Velasquez Nimatuj – Justice Beyond the Final Verdict: The role of court-ordered reparations in the struggle of indigenous women's human rights in Guatemala. The Sepur Zarco case. 12 p.m. – 1:45 p.m.
Irma Velásquez Nimatuj is the first Maya-K’iche’ woman to earn a doctorate in Social Anthropology. In 2002, she played a key role in the historical process of setting legal precedent through a court case that made racial discrimination illegal in Guatemala. She is the author of Pueblos Indígenas, Estado y Lucha por Tierra en Guatemala (2008) and La pequeña burguesía indígena comercial de Guatemala: Desigualdades de clase, raza y género (2002) and of numerous articles in books. From 2005-2013 she served as the Executive Director of the Mecanismo de Pueblos Indígenas Oxlajuj T’zikin (Support Mechanism for Indigenous Peoples). She also served as an advisor on indigenous issues for the Latin American and Caribbean office of UN Women (2014-2015). During the Spring 2016, as a Tinker visiting professor she taught at the University of Texas at Austin in the Teresa Lozano Long Institute of Latin American Studies. During the Spring 2017, she served as a Mellon Visiting Professor at the Center for Latin American and Caribbean Studies at Duke. She has lectured at universities in Colombia, Mexico, Nicaragua, the United States and Spain. Along with a team of fellow women academics they obtained an honorific mention in the first Research Price dedicated to Berta Cáceres, who was murdered in 2016. As an anthropologist, she has served as an expert witness in cases of transitional justice related to the genocide, human rights abuses, and sexual violence committed in Guatemala during the 36-year armed conflict. As a journalist in Guatemala she continues to investigate and make public the long history of colonization, dispossession, exclusion, contempt and structural racism in her weekly opinion columns in elPeriodico since 2003. Her voice extends beyond academic circles and combines her longtime work alongside local grassroots Guatemalan Indigenous communities, to informing the intellectual, legal, and political elite of Western society.